New Delhi: The National Democratic Alliance (NDA) government has embarked on a multi-pronged strategy for achieving its climate change commitments, with measures ranging from combating air and water pollution to global engagement along with managing energy demand. This has also resulted in new business opportunities for energy service companies and a renewed focus on demand- side management to help meet climate change commitments. A case in point is state-run Energy Efficiency Services Ltd (EESL), a joint venture between NTPC Ltd, Power Finance Corp. Ltd, Rural Electrification Corp. Ltd and Power Grid Corp. of India Ltd. While EESL made its mark by leveraging scale to bring down prices for LEDs in the energy sector, it is now focusing on a National Motor Replacement Program. According to EESL, the Indian industry accounts for 40% of the country’s electricity demand, and motors account for around 28% of total demand. Interestingly lighting accounts for 24%. “Moreover, during the life period of a motor, it normally goes for multiple times of rewinding, thereby reducing the efficiency further,” according to EESL which is targeting 120,000 motors from rating categories in the first phase. The projected impact has been outstanding. “EESL did a high-end estimation by considering the IEEMA (Indian Electrical and Electronics Manufacturers’ Association) data which shows that with an average motor ratings of 7.5 kW and replacement possibility for 15 million numbers, the country can be benefited with about 65 billion units of electricity per year... This translates to about 57 million tonnes of CO2 emission reduction,” EESL said in a note reviewed by Mint. This holds importance given that thermal power sector emissions are significant in India. Of the installed power generation capacity of 343,898.39 megawatts (MW), 57.27% is fuelled by coal. India’s energy efficiency market is estimated at $23 billion with a vast potential to grow. Keeping the benefits in mind, the government is working towards giving appropriate price signals for achieving demand-side response. This ranges from the perform, achieve and trade programme, a market-based energy efficiency trading mechanism for moving towards cleaner cooking fuels. 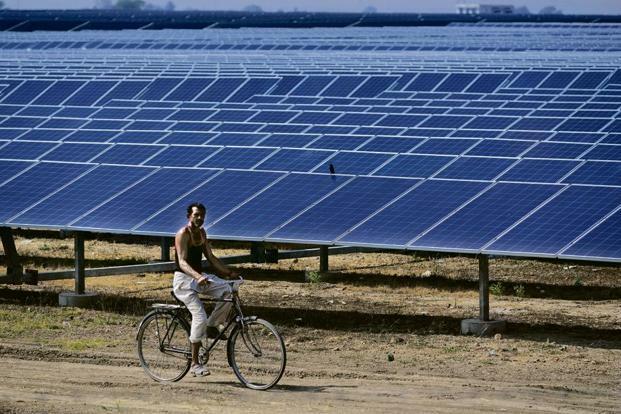 In addition, the government plans to launch the ₹1.4 trillion solar power pumps scheme named Kisan Urja Suraksha evam Utthan Mahabhiyan (KUSUM) to improve farmers’ income and reduce dependence on diesel pumps in July. A central financial assistance of ₹48,000 crore will be given for the scheme with the balance to be raised by the states, through loans and farmers themselves to generate 28,250MW. KUSUM will start with 1.75 million off-grid agricultural solar pumps. It is estimated a third of the 30 million agricultural pumps in India are fuelled by diesel. This comes at a time when the International Solar Alliance (ISA) is working to aggregate the demand for solar-powered agricultural pumps from member-nations and then call for tenders to bring down costs. The idea of a solar alliance was mooted by Prime Minister Narendra Modi during the India-Africa Summit in Delhi in October 2015. While 65 countries are signatories to the ISA framework agreement, 35 countries have ratified it. “Aligning with the guiding principles mentioned in Article 2(1) of the ISA framework agreement, we are contemplating a price exploratory tender for 500,000 pumps which will aggregate demand for solar pumps from multiple countries. India has expressed need for 300,000 pumps, Bangladesh wants 50,000 and Uganda wants 30,000 of them. But, the tender must have a commitment to buy. To get a commitment to buy from sovereign countries which may be time consuming and difficult,” said the alliance’s interim director general, Upendra Tripathy. “We have therefore gone with this suggestion from the National Focal Points of the ISA for a price exploratory tender. Bidders will have to furnish country-specific rates at the point of delivery. Solarizing water pumps can be a huge market. We can think of such demand aggregation also in other areas like street lights, mini grids, home lighting systems, solar lamps, solar cookers, etc.,” Tripathy added. ISA has inked joint declarations with the World Bank, African Development Bank, Asian Development Bank, Asian Infrastructure Investment Bank, New Development Bank, European Investment Bank, European Bank for Reconstruction and Development, and the Green Climate Fund for enhancing cooperation in the solar energy area.